Alvars are rare, natural communities that exist in very shallow soils over limestone bedrock. In North America, alvars have been found only in parts of the state of Michigan, in the Canadian province of Ontario and in Jefferson County, New York. Alvar regions are characterized by dramatic changes in moisture, ranging from very wet conditions in early spring and early summer to very dry conditions the remainder of the year. Therefore, alvars are home to rare animals and plants – such as prairie smoke, yellow lady's slipper, reindeer lichen and fragrant sumac – that can tolerate a wide variety of moisture conditions. The alvar is also a habitat for threatened animals, including songbirds such as the whip-poor-will, upland sandpiper, black and white warbler and prairie warbler. These species – both plant and animal – have evolved to best take advantage of the ecological niches offered by this unique landscape. This 413-acre property in northern Jefferson County, NY, is part of the Three Mile Creek Barrens alvar. It is one of the few alvar habitats in North America. Several rare plant and animal species live in this unique and environmentally significant alvar landscape. The sprawling property also features woodlands, wetlands and agricultural fields. Ontario Bays Initiative, Inc. in late 2006 acquired a conservation easement on the private property. The easement prohibits development of the property, which includes 5,000 feet of road frontage on the Three Mile Creek Road (County Route 5). William C. and Margaret C. Couch, of Watertown, NY, privately own the property. The couple authorized the easement to Ontario Bays Initiative, Inc. as a way to preserve and protect the land and its environmental features. It prohibits such things as commercial development, cutting of timber, and subdividing in order to preserve the scenic nature of the land and its environmental features. 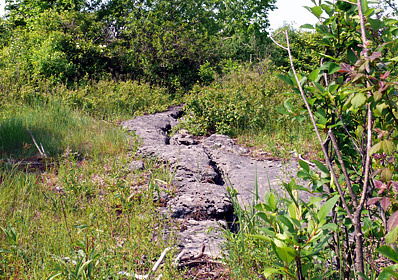 Two types of limestone woodlands – both deciduous and evergreen - have been found, as well as areas of cedar swamp. There are large areas of calcareous pavement barrens, which are regions of exposed limestone bedrock containing large fissures. The pavement barrens feature small patches of soil on both the surface and also in crevices and fissures, which support various species of plant life.